The following article appeared as an op-ed in the April 2, edition of the New York Times. It is reproduced at Links International Journal of Socialist Renewal in interests of solidarity. For more on developments in Venezuela, click HERE. By Nicolás Maduro, president of Venezuela. April 2, 2014 -- New York Times, CARACAS, Venezuela — The recent protests in Venezuela have made international headlines. Much of the foreign media coverage has distorted the reality of my country and the facts surrounding the events. Chavez’ revolutionary government spent $300 million to build a futuristic funicular [cable car]. It eliminates hours of climbing on foot up and down treacherous mountain sides to reach jobs, schools, health clinics and other vital destinations. It benefits tens of thousands of shack dwellers of San Agustin—most of whom are African descendants. March 27, 2014 -- Venezuelanalysis.com -- It’s late morning in Caracas, February 12, 2014. From the restaurant inside the hotel around the corner from Plaza Venezuela we can hear chanting, but it’s too muffled to understand. Are they yelling “Maduro Salida” or “Maduro/burro Salida” or something else? From the window, we can see people, almost all smiling white people, streaming down the street to join the first huge anti-government demonstration that signalled the onset of the current outrages in Venezuela. March 2014 -- Links International Journal of Socialist Renewal -- The passing away of Venezuela's President Comandante Hugo Rafael Chávez Frías, the top leader of the Bolivarian Revolution, on March 5, 2013, was perceived by Venezuelan people as an irreparable loss, one of historical dimensions. In the middle of the grief ...,Venezuela's people decided to keep on walking the revolutionary way and elected Nicolás Maduro as their president on April 14, 2013. But one day after the presidential elections, opposition supporters of the candidate Henrique Capriles took to the streets complying with his call to drain their repressed anger, and spread death and destruction in opposition bastions governed by right wing’s mayors. FMLN presidential candidate Salvador Sanchez Ceren. March 13, 2014 -- Committee in Solidarity with the People of El Salvador -- Just after 1:30 am this morning, the Supreme Electoral Tribunal announced the final count from the Sunday, March 9 election, giving a decisive victory to the leftist FMLN party over right-wing ARENA (50.11% to 49.89%). 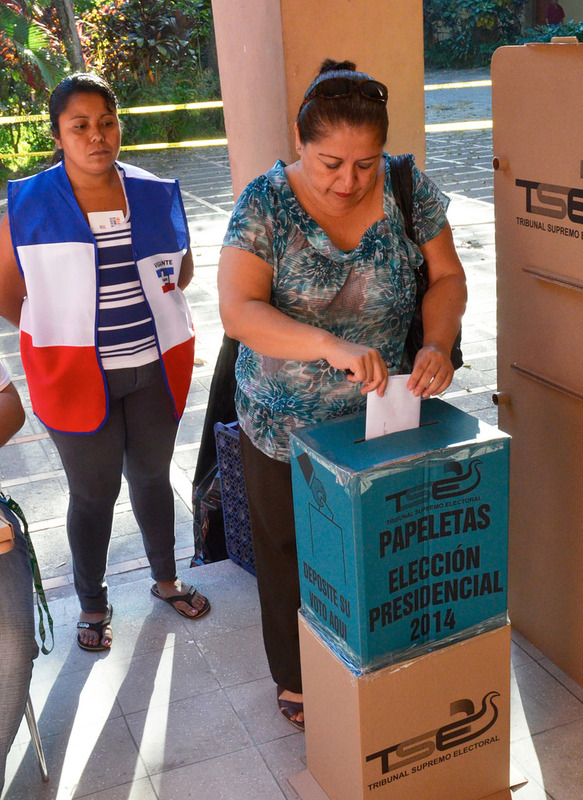 Over the past three days, ARENA has tried (almost) every trick in the book to prevent the FMLN’s Salvador Sánchez Cerén from being named president –- from calling on the armed forces to defend their false “victory” to initiating legal measures to annul the entire election. Ultraconservative US allies of ARENA –- like Rep. Ileana Ros-Lehtinen –- are already backing ARENA’s attempted electoral sabotage. Though the State Department has shown public support for the Tribunal, we need more voices in Congress weighing in on the side of democracy, reinforcing the State Department’s position and keeping ARENA politically isolated from international support. With ARENA’s legal challenges to the election still pending, the next few days will be critical to ensuring that Sánchez Cerén can take his rightful place as the next president of El Salvador on June 1. Tariq Ali presents the inaugural Hugo Chavez Memorial Lecture in London (part 1). March 10, 2014 -- Links International Journal of Socialist Renewal -- The Venezuela Solidarity Campaign in Britain on February 20, 2014, sponsored the inaugural Hugo Chavez Memorial Lecture in London. The speaker was internationally renowned Marxist author Tariq Ali. Parts 2-4 below. 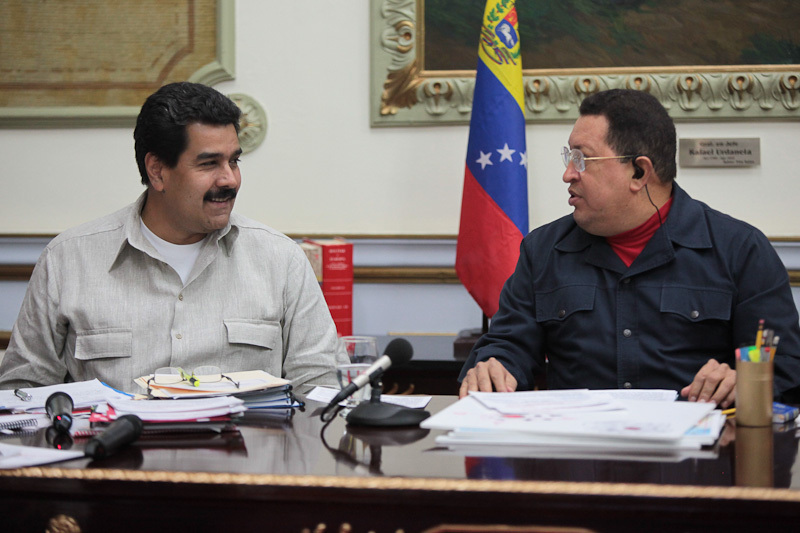 The late Hugo Chavez with Nicolas Maduro (right). February 26, 2014 -- LeftEast -- Almost a year has passed since the death of Hugo Chávez on March 5, 2013. Arguably this has been the most difficult one for the Bolivarian Revolution. Many people, both on the left and the right expressed doubt that there could be Chavismo without Chávez. Perhaps a year is still too short of a period to assess the situation after Chávez’s passing. Yet, the dynamic developments over the past twelve months call for some preliminary remarks. Through an analysis of the key events during the year, this piece advances the argument that despite the ongoing violent protest in Venezuela, the left has emerged stronger out of the crisis precipitated by the death of Chávez. In addition, the new president Nicolás Maduro has reconnected with his base and has shown a unique style and vision that have earned him admiration from his supporters and contempt from the opposition. February 26, 2014 -- Links International Journal of Socialist Renewal -- I have had a few people ask me what I think of the recent article by Mike Gonzalez ("Is Venezuela burning"), regarding events in Venezuela. Putting aside the fact he can't even get the name right of the oil minster (Rafael Ramirez, not Rodriguez), here are three things that are wrong with the article. If this was no secret, then surely there would be a mountain of evidence to prove this. But Mike Gonzalez offers none. A more serious analysis would indicate the opposite: that despite the narrow election victory by Nicolás Maduro in April 2013, the immediately wave of opposition violence and campaign around “fraud”, the ongoing economic war against the government, the municipal elections and the most recent events, there has been no visible signs of fractures in the government. Thousands of Chavistas marched through central Merida on February 12. Chants condemned the recent spate of right-wing violence and called for support for Nicolas Maduro. (Ryan Mallett-Outtrim/Venezuelanalysis). 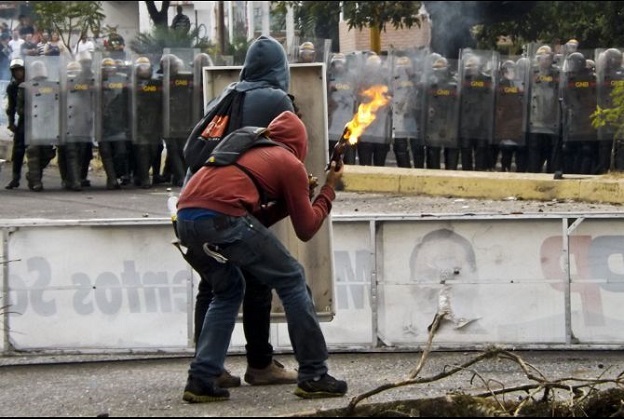 February 14, 2014 -- Venezuelanalysis.com -- Venezuelanalysis.com’s staff writers offer their insights on the violent protests that have been occurring in the country: the opposition’s strategy, how the media have reacted and the implications of the protests for the Bolivarian Revolution. No a la violencia y provocaciones de la extrema derecha en Venezuela! ¡Alto a la guerra de los medios en contra de la revolución bolivariana! 14 de Febrero, 2014 -- La Red de Solidaridad Australia-Venezuela condena los recientes actos de violencia instigados por sectores opositores de extrema derecha en varias ciudades de Venezuela. Las primeras protestas lideradas por la oposición se iniciaron el 4 de febrero en la ciudad de San Cristóbal, en el estado occidental de Táchira. Dos estudiantes fueron detenidos por presunto quebrantamiento de la paz durante una manifestación. Los estudiantes fueron puestos en libertad al día siguiente. Los próximos días estuvieron marcados por una escalada de protestas estudiantiles en los estados de Mérida y Táchira, con pequeños grupos de individuos enmascarados y encapuchados participando en actos de violencia en las ciudades capitales. Afirmaron que estaban luchando contra la “inseguridad”. No to far-right violence and provocations in Venezuela! Opposition protesters with slingshots during clashes on February 12. Photo by Angel de Jesús/AVN. End the media war on the Bolivarian revolution! February 14, 2014 -- Australia-Venezuela Solidarity Network, posted at Links International Journal of Socialist Renewal -- The Australia-Venezuela Solidarity Network condemns the recent violent actions instigated by far-right sections of the opposition in various cities across Venezuela. The first opposition-led protests were initiated on February 4 in the city of San Cristóbal, in the western state of Tachira, when two students were arrested for alleged breach of the peace during a demonstration. The students were released the following day. February 7, 2014 -- Links international Journal of Socialist Renewal -- Join this year’s Australian solidarity delegation to Venezuela, December 2-13, 2014. Registrations are now open for the Australia-Venezuela Solidarity Network’s 2014 solidarity tour to revolutionary Venezuela. The tour -- to run from Tuesday, December 2 to Saturday, December 13 (inclusive) -- will be a unique an opportunity to observe first hand, learn about and be inspired by a grassroots movement that is transforming not only Venezuela, but Latin America, and is challenging the greed and destructiveness of global capitalism by showing that a better world is possible. Since 1998, Venezuela’s Bolivarian Revolution has achieved remarkable things by putting control of the country’s politics and economy back into the hands of the poor majority. Despite the challenges created by the United States-backed opposition’s campaign to stall and destroy the revolution, this people-powered process of change continues to flourish.